The world is saddened today by the loss of Gary Coleman, the childhood star who shot to popularity on the hit TV show Different Strokes. From his days on Different Strokes, Gary Coleman became famous for the phrase “what you talking about Willis” – as he was speaking to his brother, wondering what is the world he was talking about. 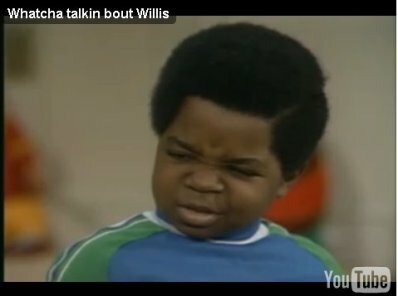 Gary Coleman’s phrase from Different Strokes – what you talking about Willis – is a phrase that I remember using, and all my friends, all the time growing up. This means, the phrase what you talking about Willis, literally influenced an entire generation. Coleman went into the hospital earlier this week after a brain hemorrhage, was placed in critical condition, and than put on life support, before he passed away this afternoon, according to the LA Times. Coleman was the cute child star of Different Stokes, and remained pint sized his entire life. Coleman, who was just 4 feet 8 inches tall, passed away at Utah Valley Regional Medical Center in Provo. Coleman was born with failed kidneys, and had two transplants by the age of 14. Coleman was just 10 when he shot to stardom on Different Strokes.